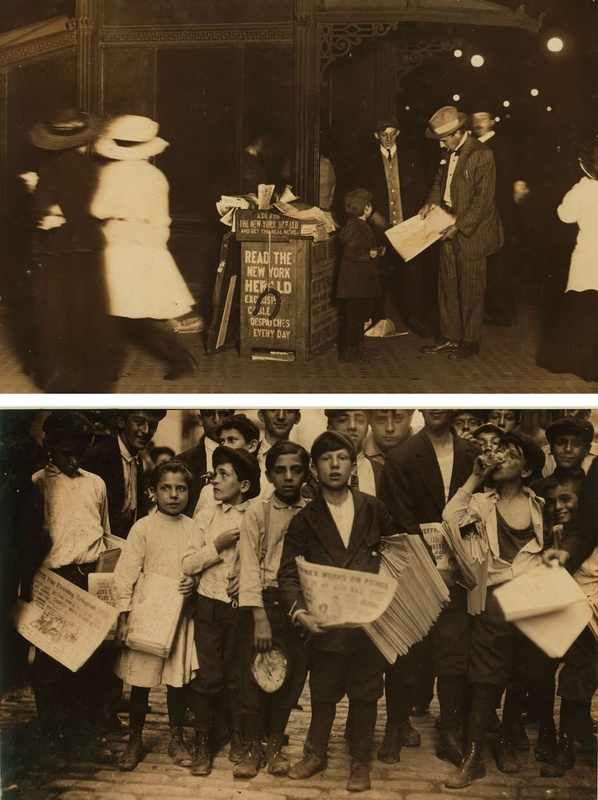 Top: "Jerald Schaitberger (7 yrs.old) helps an older boy sell papers until 10 P.M., October, 1910, Columbus Circle"
Bottom: "Newsboys and newsgirl. (Mary Malchade - 9 yrs. old.) Getting afternoon papers, July, 1910. Park Row." From the 1830s to the mid-19th century, the distribution of newspapers in New York depended on an army of children. The arrival of hundreds of thousands of poor immigrants to the city in the mid-1800's resulted in some 10,000 homeless children, many of whom sold papers or shined shoes to earn a living. Newsboys, and a few newsgirls, purchased their supply of papers from the press rooms of Printing House Square or from delivery carts and sold them on city streets, at train stations, ferry houses, and other crowded corners of the city. "Newsies," generally ranging from age six to seventeen, typically earned around 30 cents a day and worked from seven in the morning into the evening. In 1899, upon hearing that their cost for 100 papers would be raised from 50 cents to 60 cents, several thousand newsboys organized a strike against the World and Journal. The strike- which caused a reduction in the World's daily circulation from 360,000 to 125,000-ended after two weeks when the papers agreed to buy back unsold copies from the newsies at the close of the day. "No city possesses so large or alert an army of newsboys. They board every street car, beset every depot ferry house bridge entrance and elevated railroad station enter offices and ring door bells. An extra published at an unusual hour, always finds them ready to speculate by turning their small capital into papers. A few minutes after the first copies fall from the press there comes a chorus of 'Oixtray!' that pierces the most retired corner of the towering office buildings around Printing House Square, and makes everybody realize that something thrilling has happened."